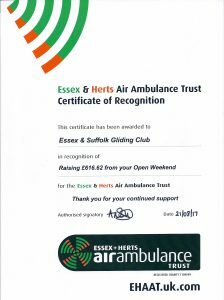 Essex & Suffolk Gliding club is proud to support the Essex and Herts Air Ambulance. 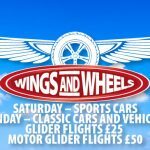 This year we raised £616.62 as a donation from our very successful Open Weekend in June. We received the Certificate of Recognition (pictured) from our colleagues at the Air Ambulance which is based at Earls Colne Airfield just a few miles away from our own airfield. Following discussions a few years ago our club members decided to adopt the Essex and Herts Air Ambulance as our chosen charity as we believe it provides a valuable service to the community of which we are all a part but which we all hope we will never need to call upon!